Slide down the Notification Bar and tap Your Internet connection is unstable. 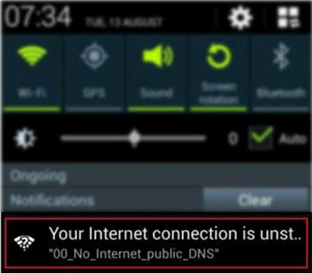 If presented with the "The Internet connection via this Wi-Fi network is unstable" pop-up, tap OK. When the Wi-Fi connection is unstable, selecting OK activates this feature and the device will automatically switch to the mobile network. 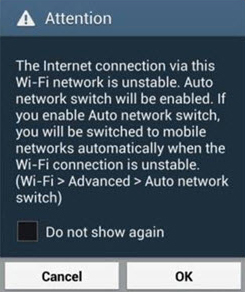 If preferred, tap Do not show again before selecting OK to prevent the unstable Wi-Fi connection prompt. Tap Menu (located in the lower left). Tap Auto network switch to enable or disable. If presented with the "Mobile data may be used to maintain a stable Internet connection. This may increase data usage" prompt, tap OK to continue.